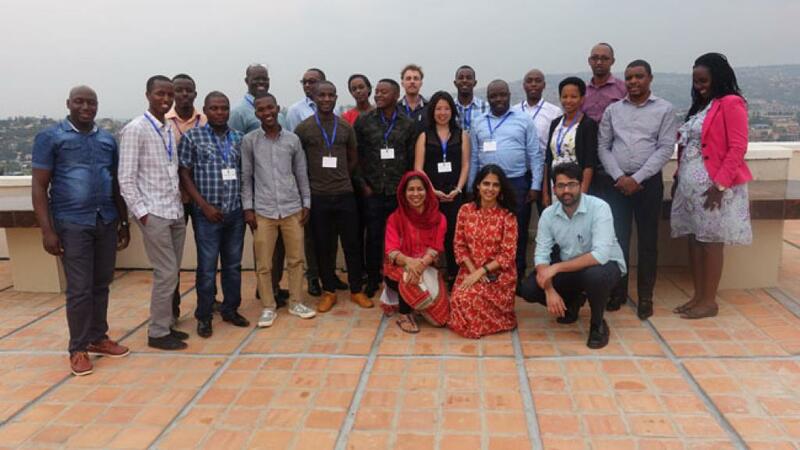 Centre for Science and Environment (CSE), India in collaboration with WaterAid Rwanda, conducted a three day training programme on Urban Rainwater Harvesting Systems from January 23-25, 2018. The purpose of the training was to develop a cadre of practitioners with knowledge, skills and attitude for mainstreaming sustainable and affordable rainwater harvesting (RWH) in Rwanda. The programme included diverse group of 21 state and non-state practitioners (engineers, consultants, planners, academicians and researchers). The training programme started with brief inaugural by Mr. Maurice Kwizera, Country Director, WaterAid Rwanda along with Dr. Mahreen Matto, Programme Manager of Water Unit, CSE. During the inaugural, Mr. Kwizera stated the aim of the training is to gain knowledge and share experience to create a community of practitioners and to get tangible outcome in terms of concept and implementation of RWH in Rwanda. He also mentioned that demand on such trainings are high and is optimistic that the knowledge gained by the participants during the training will be helpful in their work. Dr. Matto in her welcome address stated that there is a need to create awareness about the value of RWH in order to address modern day water crisis. She also stated that the outcome of the training is to enhance skill sets of practitioners required for planning and designing RWH systems. Further, Dr Mahreen Matto, talked about Planning for Water Sensitive Settlements in which she discussed the effect of urbanization on sustainable water management especially in developing countries of Africa and Asia and specifically what is happening in Rwanda. In this session the emphasis on a holistic approach i.e. Water Sensitive Design and Planning taking rainwater, stormwater and reuse and recycle of wastewater together at different scales in order to promote sustainable urban growth was mentioned. Later Ms. Shivali Jainer, Deputy Programme Manager, CSE focused on planning, designing and implementation strategies of RWH supported by best management practices, documentary on ‘Rain Catchers’ aiming at community participation. It was concluded with a brain storming exercise on data collection. The session was proceeded by extensive lecture on planning and designing of RWH system involving discussions and interactions. The day ended with a talk about the sustainability of RWH structures in terms of selection of suitable filters, operation & maintenance and assessing economic feasibility of RWH systems. Day 2 started with session on Role of GIS in watershed analysis along with understanding macro RWH structures such as Check Dam and Contour Bund. This was followed by lecture on Case Examples of implementation RWH systems in Rwanda. The session talked about the perspective of RWH structures in Rwanda which was accompanied with successfully implemented RWH case examples at various scales in Kigali. It helped in building the case and creating awareness of various innovative RWH structures which can be disseminated in other provinces of Rwanda. Later the role and importance of community participation in implementation and management of RWH systems was discussed, it was supported by an exercise named “Continuum Walk” which explored the role and intentions of different stakeholders during development and implementation of the RWH system was conducted. The last session of the day gave details about the planning and designing of Sustainable Urban Drainage System (SUDS) discussing about managing storm water aiming to reduce velocity and peak flow and improve quality of urban runoff in order to move away from typical victorial drainage design. The last day of the training was dedicated to ‘Do It Yourself’ exercise. In this session participants received hands on experience in planning and designing of RWH system at different scale and gained better understanding of managing rainwater in decentralized way and further presented their design and planning of RWH systems. The outline of presentation included data analysis and demand estimates, planning and designing of RWH structures at site. The presentations were made using Microsoft excel, power point and a representative from each group gave presentations. This was followed by feedback session to understand about the relevance of the entire training programme. Participants appreciated the content, methodology of the training and expressed their interest to implement projects on sustainable water management within their domain.